Community involvement is a fundamental component that is incorporated into the culture of the group. To show gratitude to the city they work within, Brett and Antonio are actively involved in organizations within the Boston community. Should you have a cause that you work towards, please reach out with additional information. 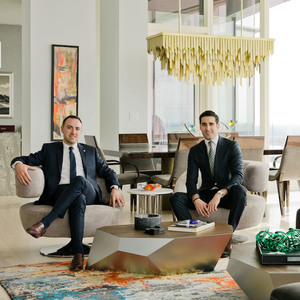 DeRocker & Khoury was founded by Brett DeRocker and Antonio Khoury. With 15 years combined experience and in excess of $350 million in Midtown Boston real estate sales, the group is built on experience, knowledge, and results. DeRocker & Khoury currently holds the #1 position for market share in Downtown Boston. Brett DeRocker and Antonio Khoury have both participated in record breaking sales in the Boston luxury real estate market. The group has additionally participated in paramount high-end rental transactions with rental values up to $35,000 per month per unit. An extensive network both domestic and abroad provides clients of the group with the highest degree of exposure to the most focused group of prospect buyers or renters. With a team of the industries finest marketing and support staff behind them out of Compass Massachusetts Boston Head Quarters, clients are delivered the most highly tailored level of service based on their needs. The group also serves an advisory position as a member of the Top Agent Network advisory board, a network of the top 10% of real estate brokers in Massachusetts. Through our experience of working in Boston's most exclusive high rises, we are always in the know of the newest listings. Below are some of our favorite residences. Browse through our collection of hand-picked luxury properties currently on the market in Boston. Should you find a building of interest, allow us to create a personalized collection of all properties that suit your needs. Please click here.